Have you ever tried to debug a problem with the XREF table in a PDF file? I’ve been debugging PDF problems for a long time, and every now and then I come across a file that has a corrupt XREF table – either because the PDF generating application did not emit a valid XREF table, or because somebody tried to edit a PDF file and did not update the XREF table. And yes, there are applications that write out corrupt XREF data – either as a result of a bug, or because the developer did not understand the PDF spec. That makes 18 bytes. For a line that ends with just a LF character, we need to “stuff” the line with a space character after the flag. So, when writing XREF data, make sure that you are indeed writing out 20 bytes per XREF entry. The byte count is not the same as the byte offset relative to the beginning of the file: The first character in the document will show a byte count of “1” – it’s the first byte, but this character will have an offset of ‘0’ relative to the beginning of the file (it is the beginning of the file). So, in order to convert the byte count we need to subtract 1 from the value that is being displayed. For the rest of this document I will use the basic PDF file that gets created via the excellent article series “Make Your Own PDF” – created by the people who brought you JPedal and PDF2HTML5, IDRsolutions. Here is a screenshot of vim editing a PDF file. I’ve highlighted three lines: The first one shows where the cursor is positioned – it is on the start of the line that starts object 6. The second highlight represents the XREF entry for object 6. And the last highlight shows the character count up to and including the character under the cursor. This is 318 characters – we need to adjust that by subtracting one to get the byte offset, so object 6 starts at byte offset 317, which is what is found in the XREF table. A different approach is to output the PDF file with the byte offsets for every line prepended to the line’s content via a small program. A while ago I wrote such a utility, which I cleaned up a little for this post. You can download the C source code here: print_pdf_offset.c. By looking at the XREF table, it’s pretty obvious that there is something wrong with this file: The XREF entries are not 20 bytes long, they are each one byte short. This probably means that the table was created on a system that uses CRLF as line endings, and I just pasted it into an editor on a Mac that only uses LF – hence the missing byte (this is not the real reason, I “broke” the file for demonstration purposes). 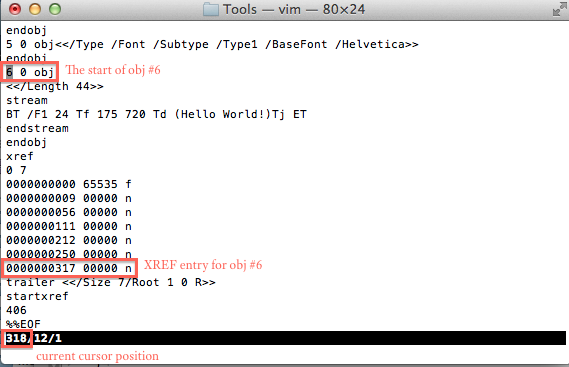 Also, the startxref information points to byte offset 406, but the XREF table actually starts at location 408. No wonder this file gave me problems when trying to open it with Ghostscript. After fixing these two problems (adding a space after every XREF table entry and changing the 406 to 408) the file loads without any problem. By the way: The corrupt file loads without any error message in Adobe Acrobat or the Adobe Reader: The only indication that something is wrong is that Acrobat wants to save the file when it’s closed – because it got repaired behind the scenes. Chances are that there is a popup informing the user that the file is being repaired, but with such a small file and a fast computer, it’s gone before the user is able to register it. This entry was posted in PDF, Programming and tagged Acrobat, PDF, Programming. Bookmark the permalink.